Does Groove belong to taiko? In a 2 day workshop in Hamburg with 10 participants from all over Germany and 1 from Hungary and also members of Kion Dojo we tried to find an answer to this question! And… let’s say we found the answer through drumming! By focusing on the groovy side of the taiko we play in Kion Dojo we started off on the first day by feeling the pulse that lies under (almost) every rhythm we play. Later, joined by more people we played a long session, with the participants divided into 5 groups. Everybody could suggest an improvised groove, which the group then would then continue to play for a while. That way everybody could do some kind of improvisation, even people without a lot of experience. While listening to the other groups and the slowly evolving interlocking rhythms in the room, almost 3 hours passed quickly! Creating art on the spot with 25 people at the same time is a great thing! 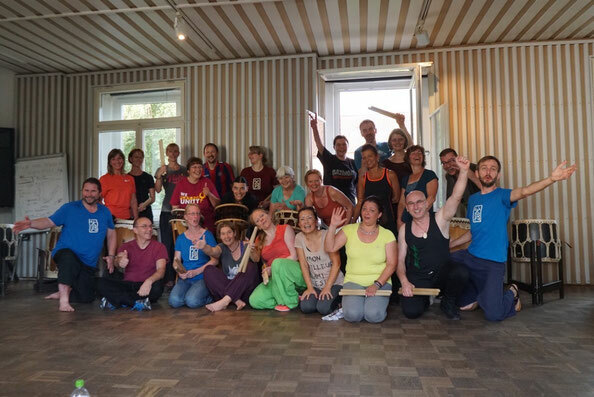 The second day began with a focus on the more technical side of groove, how to play accented rhythms and how to move your body in a relaxed but powerful way! In the last bit of the workshop we introduced the participants to 2 of our pieces, which are easy to join for everybody in a short time! We ended with sweaty clothes and great memories of a very energetic, interested and (hopefully) inspired workshop group! Let’s meet again in Groove Cooking 3!